Written by Adriana Madrinan on 01 June 2009. Clearly you are pursuing early childhood education with a lot of energy and ingenuity -- very interesting to see. I'm struck by the variety of routines, the productivity of the children, the take-homes for parents, the art work, etc. It was very intersting to interact with the children. I'm glad we figured out how to make a visit happen. Dr. David Perkins, senior professor of education at Harvard University and director of Project Zero, visited First Steps International Academy and VIP Kids Bilingual Preschool (two Edu1st.Schools) on Friday, May 15th. Visible Thinking is a research-based approach of Project Zero, from Harvard University’s Graduate School of Education. This educational approach, emphasizes the use of thinking routines and documentation to make thinking visible in classrooms and to engage students in deep thinking around the content while also cultivating the student’s disposition towards thinking. Actually, Visible Thinking includes a variety of fun and interesting classroom routines that are integrated with the curriculum content. Education has always been a topic of conversation for parents. In fact, for many parents it becomes a quest to look for the best education for their children. A similar situation faced a company called Education First Inc, which not only had the vision to find the top models of education in the world, but was committed to bring and apply them in Broward. 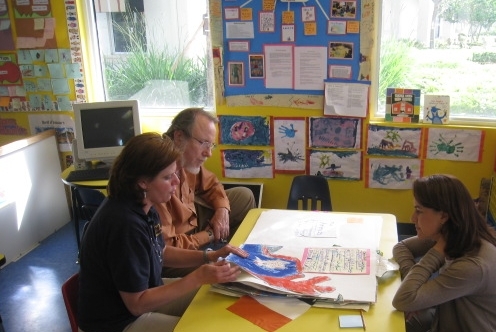 In 2006, the Edu1st.Schools decided to take the challenge and fully implement the Visible Thinking methodology to teach children from 1 to 5 years old. There are three important benefits of using this approach with young children. First, the methodology is fun and really engages students, even toddlers where the attention span is really short. Second, modeling the thinking routines helps children develop a structured and profound thinking and exposes them to different points of view. Third, the documentation allows both, teachers to visualize the thinking process of every child through the verbal and non verbal communication, and children to visualize their thoughts and ideas. [flickr photo=3924880996 size=small align=right vspace=0 hspace=10]The results have been amazing. In one hand, children have become instinctively interested in content, inquirers, critical, creative and problem solvers. Also, they have shown a more organized way of thinking. In fact, the use of some conceptual maps to classify and organize their ideas was something that had been underestimated at this young age. In the other hand, teachers have mentioned to be far more involved with the whole class and even felt the birth of mini “cultures of thinking” in their classroom and school. Changing a Culture of Learning is a collaborative work. Education First Inc. is not only committed to provide the best in Early Childhood Education, but also has been invited to actively participate in some international and national conferences. Education First Inc. presented the children’s work as results of the use of the Visible Thinking concept in their schools at the VT Conference in Amsterdam at the International School of Amsterdam (April 2008), and participated with the lecture “Our Experience in Changing into a Culture of Learning” at the Mid-Michigan Culture of Thinking Collaborative Conference in Frankenmuth, Michigan (April, 2009). [flickr photo=3924094333 size=small align=left vspace=0 hspace=10]Last but not least, Edu1st was present at the14th International Conference of Thinking in Kuala Lumpur on June 22-26, 2009 with three posters explaining the Creation of a Culture of Learning for the 21st in Early Childhood and how to stimulate critical, analytical and creative thinking in preschool through the use of Thinking Routines and Concept Maps.